APRIL 2013: G’day and welcome to our very first monthly fishing wrap up from Fraser Island – we hope it’s the first of many. As regular visitors to Fraser already know, the Jetty Hut is Kingfisher Bay Resort’s main marine hub for water sports and beach activities, and is a top place to grab some nibbles, a cold beverage and settle in to watch the sun set over the Great Sandy Strait each afternoon. Fraser Island itself is also a thriving hotspot for fishing activity along Australia’s east coast and fishing off the resort’s jetty and in the gutters on the eastern beach is a great experience for young and old alike. At Kingfisher Bay, we even run clinics for those that want to learn to fish and our regulars are always ready with a smile and a tip. From my station at the Jetty Hut, I have a spectacular view across the Great Sandy Strait, past Big Woody and Little Woody Islands towards Hervey Bay. Little Woody and its surrounding reefs were once popular fishing destinations but are now inside a designated green zone – or ‘no take’ fishing area unless you have a permit – so make sure where you cast your line if you’re out on the water. Inside this zone (between Little Woody and Fraser) lies a large artificial reef which is an excellent FAD (Fish Attracting Device) attracting many species such as Snapper, Parrotfish, Squid and Sweetlip. Similarly, the mangrove banks and the sandy tidal flats on Sunset Beach at the resort are great locations for Mangrove Jack and Barramundi. You may even land a nice Bream or Flathead when beach fishing around the mouth of the freshwater creeks. Baitfish - Hardy Heads, Garfish and Herring - often school under our jetty and attract large pelagic fish such as Mackerel, Trevally, Bluefin Tuna, Queenfish, Coral Trout and Emperors. We’re also currently seeing quite a few Mackerel, Barramundi and Jewfish in the surrounding waters. Coming into May, we will see the start of the winter Tailor run where fish can reach sizes up to 5kg! Gear up for and target Tailor with gang hooks and pilchards or metal lures (all of which can be purchased from the Jetty Hut) and start reeling those fish in. • The animal provides anglers with a good sport fish match on light gear and is commonly misidentified as the Silver or Black Jewfish. Bag limits apply and this species has a minimum size limit of 45 cm. 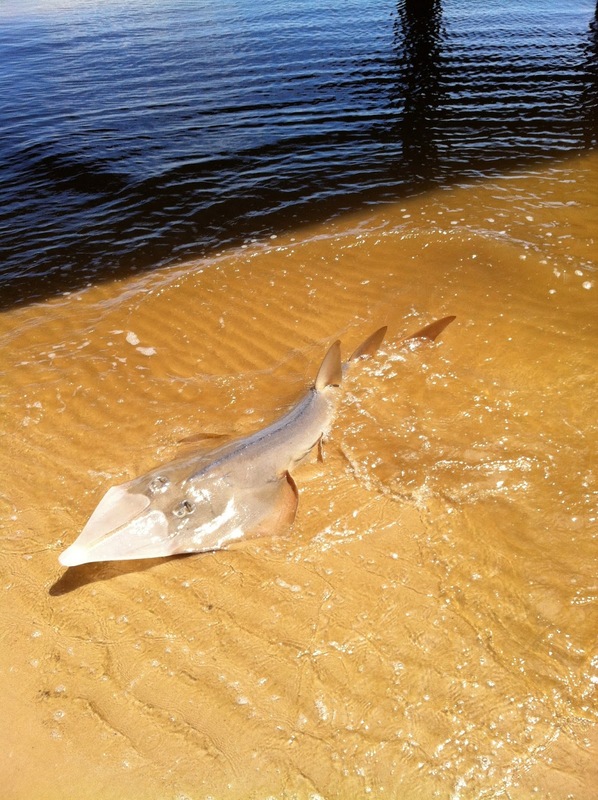 • Easily recognized by its wedge-shaped disc and long triangular nose, it is commonly called a Shovelnose Shark. 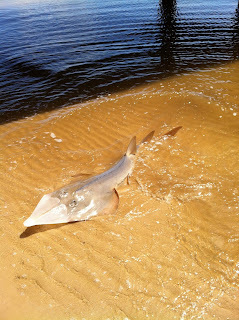 David's 'catch of the day' was caught and released on the beach just beside the jetty. NB: The picture used in this blog is not the actual fish caught. • This large predatory fish is commonly found in estuaries and coastal bays along Australia’s East coast. Live bait works a treat but bait prawns from the Jetty Hut will do just as well. These Flathead have a maximum legal size of 75 cm and a minimum of 40 cm. Until next time, may the beer be cold and the fish biting, Ranger Grant. Grant is an environmental student who loves fishing, kayaking, hiking and free diving when he gets the chance. He is also a passionate musician and is often found entertaining Jetty Hut guests on his acoustic guitar in the afternoons.